I’ve struggled for the past two weeks to find anything of substance to say about my season opener in Oceanside. The race unfolded pretty much the way I expected. I swam about where I usually do; the swim in Oceanside has never really suited me as you get a really short warm-up and the starting area is really tight, neither of which tends to lead to great swims. I’ve swum better (but not here). And I’ve swum worse. The one bright note is that I seem to have started 2016 where I spent most of 2015 – roughly able to control my own destiny in the swim; I’m no longer in real danger of losing a race on the swim. Things need to break my way a bit for me to end up closer to the front, but I think the hard work I’ve done in the pool has alleviated at least some of the worry I’ve had at the start of races about, “okay, you cannot mess this up…” I don’t know if I’ll ever make the leap to being a true front pack swimmer, but I’ll continue to work towards that. But relaxing the focus I had on 2013 of needing to become a swimmer has, unsurprisingly, actually made me a better swimmer. My top end is better, but really, it’s my base level of performance that has risen the most. Overall, I’m a more consistent swimmer, and I’ll take that. For now. On the bike, I came out of the water with a lot of strong riders, and I went with them. The topography of the Oceanside course is roughly opposite of what I’d like as someone who’s a bit on the lighter side – with the flat stuff early and the hills late – but ultimately, I rolled the dice to ride with some of the strongest riders at the half-distance in this race, and I just didn’t yet have the fitness to do so for 56 miles. This is probably a good thing. 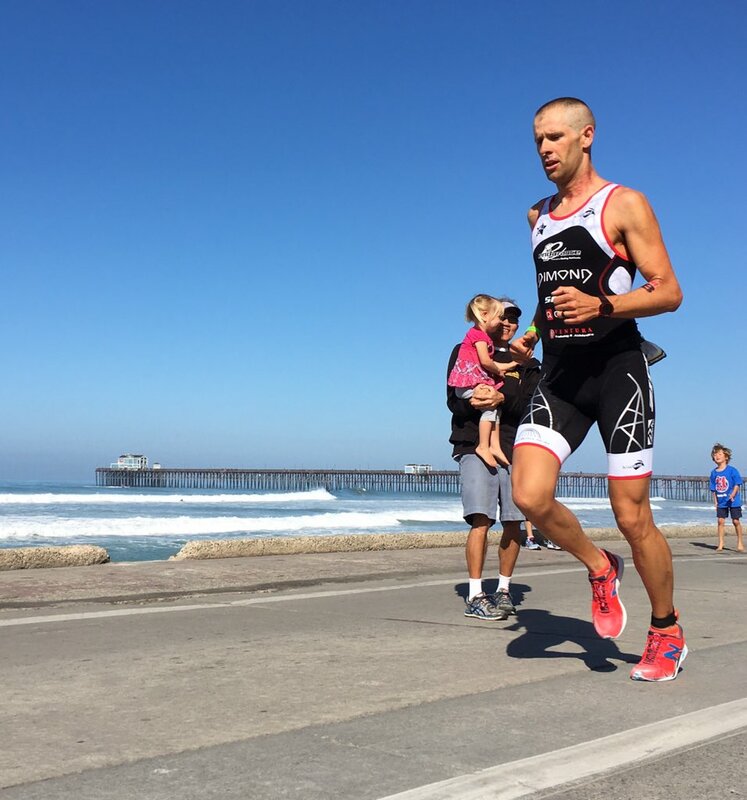 My best race in Oceanside came in 2011, after I raced the Abu Dhabi long course tri, then with a 200km (124mi) bike portion, and had really deep fitness on the bike. Fitness that I really struggled to hold through to Wildflower that year. Part of the goal this year was not to be in peak shape too early, since that pattern of getting there and not being able to hang on has been one I’ve repeated on multiple occasions with poor results. The years that I’ve been a bit short on fitness on the bike at the first race of the season has generally been a year where things have worked out well – 2009, where I struggled at Oceanside before a breakout performance at Wildflower; and 2012 where I struggled at Leadman 125 (roughly the same date as Oceanside) before maybe my two best ever races at Wildflower and IMTX. I feel like I came into – and came out of – this race with somewhere to go, fitness wise. And that’s important. Because six weeks is too long to simply try to “hang on” to peak fitness. On the run, I ran almost exactly what I thought I could, including a good negative split, and it was my fastest half marathon in probably two plus years. It was a good run, reflective of a solid base of run fitness – lots of long runs, but not too much speed work. And I crossed the line in 10th, competitive in the field, though again just shy of the 4:00 mark, though this was my fastest time on here on what is arguably a slower course (slightly) than in 2011, when they didn’t route you up the short-and-steep climb up to the boardwalk. In hindsight, a perfect race might have netted me 8th, a few minutes faster with better pacing on the bike and a bit more aggressive running on the first lap of the run. Oh, and I could have been quicker in transition. I’m definitely stuck in the steady-and-deliberate (but also relatively slow) routine of Ironman transitions. And I’m also for sure showing a bit of rust after not racing something short (how did I come to think of a 70.3 as short when I came to endurance sport as a 6min racer on the water…) since June of last year. None of this is particularly insightful. Or particularly useful to anyone. But I felt I needed a preamble (shockingly wordy, too) to the two things I wanted to actually talk about. Even if the race part of the “race report” is really super boring. The first was talking about the joys – and challenges – of having my family there. When Jill and I had one kid, Quentin came to a lot of my races. I’d actually say for 2011 and 2012, he probably came to most of my races. At the very least, it was as normal for him to be at a race as not. Since having our twins, the kids have been at almost none of my races. I can name them all – Oceanside 2014, Princeton 2014, IMAZ 2015, and Oceanside 2016. That’s it. My parents come to a lot of races, but there’s something special about having your wife and kid(s) there. It’s a reminder of what I’m racing for. This is my job. It’s how I support my family. And seeing them is a powerful reminder of that. But it’s also a challenge. Not in terms of logistics. We were able to get a great rate on a two bedroom condo walking distance from the race. Jill and the kids slept in one room. I slept in the other. The kids are all good sleepers. My sleep wasn’t compromised. My pre-race routine was pretty much identical to any other race. But it was a challenge to not be able to turn off the “parent” part of my brain before the race. One of the hardest parts about being a professional athlete is the same thing that makes it so rewarding – it’s all consuming. You can never really turn it off. Even when you’re not training, you need to be mindful of nutrition, sleep, recovery, etc. Sort of like being a parent. And one of the things I enjoy about races is that I can, briefly, turn off at least one of those “always on” parts of my brain. When I’m at a race by myself, I don’t have to be a parent. I don’t have to be available, mentally, to anyone else. I don’t think that having my family there, on balance, affected my race either way. There were some huge positives seeing them on the course and, mostly, being able to spend time with them in the period after the race when I can, briefly, turn off the “athlete” part of my brain for a couple days. But I noticed that in the week after the race, when the fatigue from the race settled in, I felt more overwhelmed by the “parent” part of my brain. On Wednesday post-race, I found that I just needed to go for a walk around the neighborhood to have some quiet time with no one around. That’s time that I would normally get at a race, and I found I missed having it. It’s hard to be a parent all the time. It’s hard to be an athlete all the time. I realized last year the importance of needing to turn off the athlete part of myself every so often. But I don’t think I necessarily realized in as concrete a way the need to turn off the parent part of my brain as well. Jill and I took our first vacation together in almost five years this spring for a few days. (We could have used a few weeks…) I found myself moving from my office (which has no doors), to the garage, to outside, and then back to my office to write this because of the inevitable madness that ensues with three young kids in the house. For most of my career, this has been a strong suit. For 2013 and especially 2014, I thought I let it slip a bit. And now I think it’s back to being a strength. One big difference now from then is that I race with two bottles on my bike. I have a permanent bottle cage behind my saddle. I really like that I can mix the new EFS Pro very strong and still digest it easier. I always struggled to digest gels, especially in halfs; they were just to strong. But I struggled to get enough calories in with drinks. Now, I can mix my drinks strong enough that it’s a non issue. I mixed two 26oz bottles with 9 scoops each for a total of 360cals per bottle (720cals total during 2:11 bike). I do think I could have drank more early – the hardest part of the flat part of the Oceanside course being early is that on flat roads when it’s also very cool, you don’t think about eating/drinking. But overall, I was able to get the calories I needed without issue, which helped me be strong across the day. My race breakfast is virtually unchanged after seven years, and you can find it here. I used to take supplemental salt religiously during the race, but now I do a sodium pre-load before the race and find I don’t need any extra salt. I continue to think that a good breakfast is the foundation of a solid race day nutrition, but I also appreciate the ability to easily digest even more calories on course, something which EFS Pro clearly makes easier for me. So I’m back to basically eating as much – on-course – as I did before; but I have an easier and more reliable method of doing it now. 2009 was actually one of my best years from a swim standpoint; I was finally able to absorb a lot of the (excessive) work that I did swimming with an ITU-focused squad as I transitioned to training on my own. I lost a lot of that due to my crash in 2010, and I still think that the permanent damage to my left arm/shoulder is somewhat of a limiter. But I swam faster, relatively, than I did in 2009 or 2011. Some of the credit here for sure goes to ROKA. I swam in the new Maverick X – one of the first 10 production prototypes, and it is without question the best suit I’ve ever used. I also think I’m a smarter swimmer, knowing that I need a bit of clean water at the start, being better about managing energy, etc. And I think overall, I’m just a better swimmer; not surprisingly, consistency in the water pays off. Mostly, I’d say this is the result of focusing on day-to-day execution rather than worrying about the larger issue of how good (or not) I am as a swimmer. I don’t worry about swimming in the front pack or not; I worry about this. That said, a great wetsuit makes a real difference. I’ve swum the best in suits where I’ve been the happiest. I’ve swum in some good suits. And I’ve swum in some great suits. If you don’t love your current wetsuit, try a different one. There are more good options than there used to be. The base level of cycling in 70.3 racing has dramatically increased in the time that I’ve been a pro. Much more so than Ironman cycling. The same power output that would have given you a huge gap on the field is now required just to stay in the field. Some of this is better equipment choices and positioning across the board. People waste less watts, in general, than they did. So the racing is tighter. But it’s also just harder. 70.3 used to be the short long-course race. Now it’s the long short-course race. 70.3 is raced much more like Olympic distance used to be raced. Ironman is trending this way, but you still can generally bet on people blowing up as a result. Not so in 70.3 races. You need to be prepared to race the whole bike from the gun. On the equipment side, I continue to be impressed by the utility of a 1X drivetrain. There are some really challenging climbs on the Oceanside course. But it’s also a course where most of the race is flat-to-rolling. I never felt limited by having only 11 – as opposed to 20 or 22 – speeds. I ran 54-11/30, which is my “most often” configuration (I’ll run 54-11/26 at Ironman Texas), and it was great. I could have run 54-11/28 and been fine. I never really needed the 30, even on the big climbs. I used it, but I could have done without it. The aerodynamics of the Dimond are really awesome. Looking at total bike+rider aerodynamics, some of that is the 1X. Some of that is clothing – I am back racing an ITU-style (back-zip, minimalist) race kit from Kiwami, but I’ve added a textured short-sleeve “jersey” for the bike, which gives a big aero advantage but still allows me to run in a “free-er” fitting kit. I rode quite a bit faster in 2016 than in 2011 (2min) on quite a bit less power (about 10w less average and normalized). Chalk that all up to better equipment selection. It does matter. But, as I said at the outset, even that same power wouldn’t have made up for the difference to the fastest riders. The same power as 2011 would have had me at maybe 90sec faster (depending on how I distributed it), when I was about 90sec slower than the faster rider. This year, I was four minutes slower than the fastest guys. So aerodynamics matter. But it’s more than just the aero differences that are contributing to the fast bike times. You can’t ignore any of it. Wanting less offset is not the same as wanting the least offset. I have some zero-offset shoes (the NB Minimus road and trail) that I like running in. But I really don’t like running fast in them. For me, the faster I have to run, the more offset I want. I want more offset in transition (meaning running off the bike) than not. 6mm seems to be my sweet spot for all-purpose running. I’d say 10mm is more of a sweet spot for running off the bike. Overall, I’m older. I’m faster (except in transition). And I’m a little bit wiser. In some ways, I feel like I’ve made surprisingly little progress. In other ways, I feel like I’ve made a lot. The race itself was non-remarkable. But there were still lessons in that for me. And hopefully for some of you. hairdo = peaky blinders inspired?? otherwise, thanks Jordan, very informative blog as usual. Jordan has a new post up; go get your cup of coffee, sit in your comfy chair, away from the kids (! ), and get ready for a meaty, honest and in-depth essay. Thanks so much. One of my mottos, borrowed from I believe, the Navy Seals is, don't rush. Move quickly but never rush.